Na łamach portalu FilmCyfrowy.net pojawił się niezwykle interesujący artykuł nt. zaawansowanych funkcji rejestrowania obrazu w kamerach Kinefinity KineMINI. Zastosowana metoda badawcza pozwoliła sprawdzić rozpiętość tonalną i czułość matrycy kamery. Ponadto ukazane zostały istotne różnice w obrazowaniu w każdym z dostępnych trybów ISO: Advanced, E/I Mode i ISO Mode z dodatkową funkcją Highlights for ISO Mode. Po miesiącu przygody z KineMini mogę powiedzieć jedno: to zaawansowana kamera, którą zdecydowanie należy poznać przed zdjęciami. W przeciwnym razie możemy zostać niemile zaskoczeni. To nie Blackmagic, który daje ograniczone możliwości ingerencji rejestrowanego obrazu (ISO, temperatura barwowa, opcje RAW albo ProRes, wybór przestrzeni barwnej Film albo Video i właściwie tyle). Z KineMini jest inaczej. Nieznajomość możliwości tej kamery może sprawić, że użytkownik lub właściciel może się niepotrzebnie zrazić do niej. A nie ma podstaw. Należy dobrze się zapoznać z nowym przyjacielem, który jest swego rodzaju hybrydą kamer Arri Alexa, Red Epic oraz Sony F55 . Tomasz Wolski from FilmCyfrowy.net shared with us his first KineMINI film camera test done in cooperation with Jurek Rudziński. Main features which were described are dynamic range and ISO sensivity. Testers also checked advanced ISO functions in the Kinefinity camera and how they affect on the footage - Advanced, E/I Mode and ISO Mode with extra Highlights for ISO Mode. We translated this interesting test specially for you! "After a month of my adventure with Kinefinity KineMini there is one thing that I can say for sure: this is an advanced camera and before shooting one should definitely learn how to use it. Otherwise this may be an unpleasant surprise. This is not a Blackmagic with it's limited options to adjust the recorded image (ISO, colour temperature, ProRes or RAW options, selection of colour space for “Film” or “Video”, and that would be all). KineMini is different. A user or an owner unfamiliar with it's capabilities may get unnecessarily discouraged. And there is no need to be. You should make a proper acquaintance with your new friend, coming as a kind of a hybrid of Arri Alexa, Red Epic and Sony F55 cameras. But before I proceed with my endeavours to explain the complexity of KineMini with ISO as an example, please take a look at the picture below. This panel serves to measure the dynamic range of the camera. The special device was designed and developed by Jurek Rudziński – a movie operator involved in co-operation with the FilmPRO magazine. For the past few days Jurek has been studying KineMini extensively – the results will be presented in the next FilmPRO issue. Meanwhile, I will concentrate on two features of this camera. The first is the dynamic range mentioned above: we can see 12 full apertures and the thirteenth is showing vaguely in the greys (it is better to open the picture in a new window). Davinci Resolve in the Waveform window shows 11 apertures and the 12th vaguely. The screenshot is presenting an developed RAW file (with 100% white), and the panel below is the Cineform format. The camera has three ISO modes: ADVANCED, E/I and ISO Mode, selected from the SHOOTING MODE menu. This is where we decide which mode of operation to choose for the image sensor. E/I Mode is a basic mode – a regular ISO option. Here we select ISO values from 80 up. ISO Mode is more advanced. Menu in this mode allows to access additional options - HIGHLIGHTS FOR ISO MODE – values from 3.3/1.0 to 6.3/4.0. Here the analogue enhancement improves the camera capability to capture light. Let us look at the values 3.3/1.0. The number 3.3 denotes the number of apertures from 18% grey, whereas 1.0 the number of apertures from 90% grey. Information on this are included in the camera manual, currently available only in Chinese. I am waiting impatiently for the user guide in English. This subject will be discussed in detail by Jurek Rudziński on the pages of the FilmPRO magazine. At this point it is also important to note that in highlights the camera does not record more data than those visible in the preview. If the 99% zebra shows overexposure, it means that this does not contain any more data. Remember about it when shooting and set the exposure parameters accordingly. A Blackmagic, on the other hand, allows to derive shapes and details from white. In KineMini we can use organoleptic ways to see which settings are the best for highlights, without the need to calculate the apertures. By shifting the HFIM values we will see which settings will show – among the overexposed lights – the discernible details of a glowing lamp, for example. The difference between the E/I Mode and ISO Mode is presented on the following figures. Here we have the same values of ISO – 200 and the same aperture in the lens. The E/I mode yields overexposure with three apertures (clipping). After setting the camera to the ISO mode we obtain one aperture. With this we have also lost some data in the greys. The ADVANCED mode is a combination of the two above options. Apart from HIGHLIGHTS FOR ISO MODE we have additional settings. Pressing the camera joystick downwards twice allows to obtain additional values, which provide optimum settings for the specific ISO value, e.g. 6.3/1280. Note that with some ISO values a “!” is displayed, which means that this is a minimum ISO value for the present Highlights settings. 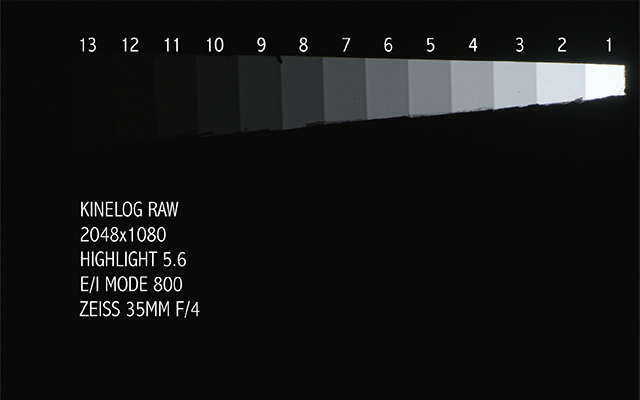 The figures below (screenshots) show how these settings work in practice with a high ISO value. First, there are DNG files. Pay attention to the noises in the corresponding E/I, ISO and ADVANCED modes, with the same ISO value of 6400. Both RAW and Cineform show vividly that the ISO MODE and ADVANCED option shifts gamma. We lose data in highlits and gain in shadows. This gives a lot of room to adjust the image to the existing lighting. 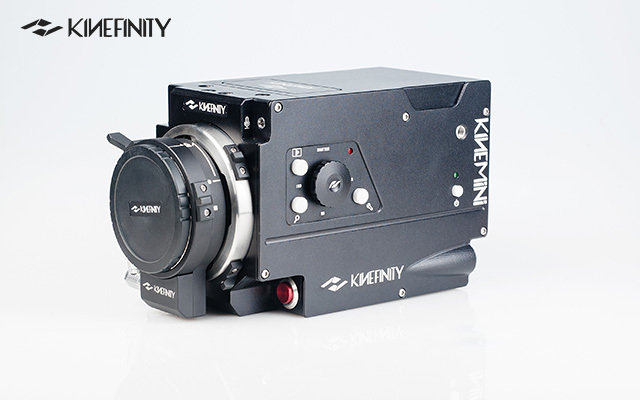 More information on the KineMini 4K camera coming up soon."